What is it? A fungus (it's scientific name is Guignardia aesculi) that lives inside the leaf - the only sign of the fungus is the damage it does to the leaves. What damage does it do? 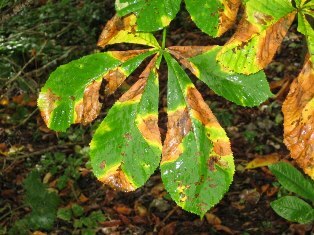 It produces brown blotches on the leaf. The blotches are irregularly shaped and have a yellow ring around their edge. How serious is it? Not at all serious, it is just a little unsightly. Damage happens late in the summer. It is especially prevalent in damper climates in the west of Britain. How long has it been attacking our conker trees? It was accidentally introduced from North America about a century ago. Don't confuse it with the leaf blotch fungus. Find out how to tell the two apart. Find out more from Forest Research and the Royal Horticultural Society.